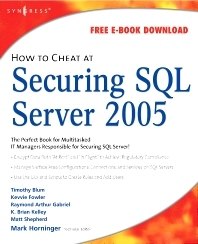 The perfect book for multi-tasked IT managers responsible for securing the latest version of SQL Server 2005. SQL Server is the perfect product for the How to Cheat series. It is an ambitious product that, for the average SysAdmin, will present a difficult migration path from earlier versions and a vexing number of new features. How to Cheat promises help in order to get SQL Server secured as quickly and safely as possible. System administrators running SQL Server or Windows environments and looking for an updated concise guide to the product. Security: Why Worry About It?